For a current project, I needed a datagrid with partially transparent rows. No problem I thought - I’ll just extend the V2 datagrid and write my own versions of the required methods. All so simple in theory, not so simple in real life. There are two things that must be made transparent, the general component background and the background of each row. I first tried overwriting the methods I thought to control this but that did not work. The one who made the datagrid never thought that anyone would ever want partially transparent gridrows. The component just does not contain any code that enables this. Another thing is that no matter what you do, you cannot re-pack or alter the datagrid assets that are used to draw the grid. The grids assets are stuck inside a SWC file and even if you rename the SWC to ZIP and extract the contents, you’ll find some of the assets to be inside a SWF. Reversing this SWF is out of the question. I’ve browsed the whole class hierarchy and I cannot find a place where the component background is drawn using scripting, so I’ve concluded that it must be embedded within the asset SWF. The same goes for the gridrow class. In theory, I could just change the beginFill-metod that tells how to draw the rows, but for some reason this won’t work. I tell it to use Alpha, but the setting is just ignored. Where to go next? I can’t post the FLA for this example without breaking the Macromedia EULA, but just add a datagrid to your library and paste this code in frame 1 to see it working. You may also want to add a background image to really see the transparency. This was also the first project where I used the XRay debugger extensively. Great tool for the output I get from the debugger in the Flash IDE is worthless. I can completely relate to the difficulty of skinning the v2 components. Since these were the base for Flex 1.x components, it’s not much easier there. I know this isn’t of any consolation right now, but for what it’s worth, almost all the Flex 2 components have numerous transparency options right out of the box. I put together a simple example that mirrors your problem in MXML. 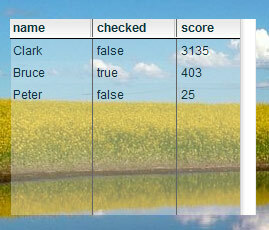 I also included an extra few lines of code to make the “true/false” column into a CheckBox. Most styles applying to the DataGrid can be found under the help entries for the List Class, but there’s no link in the docs from the DataGrid to the List class? It would be really useful to have one page per class/component listing all the valid styles for each component, complete with what classes they inherit the styles from. Now I have to hunt through the class inheritance tree/docs to find all the supported styles. Standardizing the class library into a consistent and cohesive framework that can be leveraged across both Flex and Flash authoring is a big part of what the whole Flex Framework 2 is all about. I can’t say (because I don’t know) what the Flash authoring team has up their sleeves in the future, but I would expect this to be on this list. As it stands today, Flex 1.x has done a great job of taking this first step. Take a look at the DataGrid documentation (Flex) below. If you scroll down you’ll see all the styles you can apply including those styles that are inherited. FYI, WaitXframes is not neccessary in your code. Thanks for share your knowledge with the other people. I added a checkbox control into the datagrid, however when I set the _alpha property the checkboxes disappeared too? any ideas? I’m just beginning to delve into the world of Flash and I must say I am quite excited to see that Flash has support for datagrids. I have always been very disappointed with all of the PHP datagrids I’ve been able to find. i want use my grid html code. I how do? Hi, Is it possible to also make the header row transparent?